. : Optics & Photonics Focus :: The Future of Barcodes :. The unit of the Bokode. 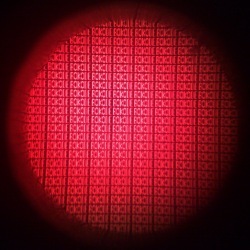 A Bokode is composed of a tiny optical lens which hides a series of miniaturized 2D barcodes. Surprisingly, a camera taking an out-of-focus picture is able to create a sharp image of the Bokode. Human beings and computers do not see the world in the same way. That is why it is not an easy task to get computers to recognize objects; many have tried, but only a few have succeeded. The classic barcode stands as a clear example: while a person sees just a series of shapeless parallel lines, a machine can use it to identify objects. 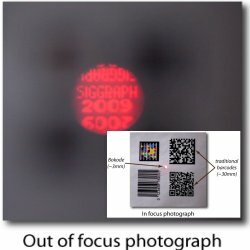 Now, the Camera Culture research group at MIT (Massachusetts, USA), led by Ramesh Raskar, may have developed an improved generation of unique ID tags, taking the best features of its predecessors and expanding the possibilities of barcode technology. As opposed to standard barcodes, a Bokode is almost invisible to the naked eye from a distance. It appears as a tiny, completely unobtrusive red LED (i.e. Light Emitting Diode – a really small light bulb) with a diameter of 3mm. However, a Bokode is much more than a simple LED: it is composed of a tiny optical lens that hides a series of miniaturized 2D barcodes. Ankit Mohan, the main scientist working on the Bokode project, explains that "Bokodes are tiny barcodes which can encode binary data, the view angle and the distance of a viewer from the object. A camera positioned up to four meters away can capture this pattern and decode all this information." A Bokode can store much more binary data than previous barcodes: for example it can store the identity of a product as well as all its ingredients, and perhaps even recipes or further preparation suggestions. Of course, other technologies have been implemented in order to enhance the capabilities of barcodes. For example, the QR codes are a sort of 2D barcode. They provide unique ID tags that can not only be used for object identification but also for many other interesting applications. QR codes can store generic sequences of characters (letters and numbers), such as short sentences or URLs, while a normal barcode can only encode sequences of numbers. QR codes are widely used in Japan where even the cheapest mobile phone can read one with its own camera — as long as a good picture, close enough to the tag, is taken. Barcode technologies. Some of the previous barcode technologies compared with the Bokode prototype developed at MIT. Another evolution of the classic barcode is represented by the RFID tag — Radio Frequency Identifier tag. An RFID tag is a microcircuit that, in the presence of an appropriate electromagnetic field, emits a signal. RFID tags are now everywhere. For example, you may have noticed them as stickers on book covers in bookshops. Since they are read by RF readers they eliminate the need for a camera and they can be hidden inside an object, unlike barcodes. Some countries employ RFID microchips to identify lost or abandoned pets. The Bokode is the latest addition to barcode technology. Its design reverses the principle of a well-known optical trick, the bokeh effect. The bokeh is the blurring of the out-of-focus areas of a picture. This effect, widely used by photographers, can, for example, blur the background in order to highlight the face of a particular person in a portrait picture. The rays of light in the background of the image then blur into circular blobs, called circles of confusion. In a similar way, the rays emitted by a Bokode are transformed into a disk that reveals in sharp images the miniaturized barcodes hidden behind the lens. From the user’s point of view, the main novelty is the Bokode’s ability to provide angular information. This means that the Bokode gives different information in different directions, a complete innovation compared to previous barcode technologies. "For example, a cereal box right in front of you," says Mohan, "can give you its nutritional information, but another cereal box which is next to the one you are looking at (and, therefore, at a different angle) can say Hey look at me, I am a dollar cheaper!, showing you its nutritional information only when you decide to go in front of it." How can a Bokode provide angular information? The lens shows different portions of the tiny hidden barcodes at different view angles. It is like looking through a keyhole: you need to move to the left if you want to see something on the far right hand side of the scene. Using this trick the Bokode can store much more information than a single barcode can, effectively hiding hundreds of 2D miniaturized barcodes and acting as a magnifying lens when captured by an out-of-focus camera. More importantly, it can associate angular information to different portions of the hidden barcodes: like in our keyhole example, if we are able to see only the miniaturized barcodes on the far right hand side behind the lens, this means that the Bokode is positioned to our right. Of course the algorithms developed by MIT are much more accurate and can provide detailed information on our relative position to the barcode, including all six degrees of freedom (angle and distance). The bokeh effect. A Bokode occupies very few pixels and appears as a dot in an in-focus photograph. The barcode information is revealed in an out-of-focus photograph appearing as disks, called circles of confusion, produced by the bokeh effect. Thanks to this unique feature, the possible applications are much wider and more interesting than in previous barcode technologies. David Marshall from the School of Computer Science at Cardiff University in UK, who has years of experience in the field of computer vision and image processing, comments: "I am not sure if this technology is a direct replacement for standard tagging of goods, but for some applications, such as augmented reality and motion capture, it has a lot of potential due to its directional tagging feature." As a matter of fact, augmented reality applications — in which computer generated images are superimposed to real world scenes — have already been shown by Mohan and his collaborators, proving how the Bokode gives a much more robust estimate of a 3D object location than previous augmented reality techniques. Marshall, who is particularly interested in motion capture, explains that "right now we attach infrared LEDs to certain skeleton points of a person and then we capture them using a quite complex and expensive system of cameras. If we were to substitute infrared LEDs with Bokodes, the system would be much cheaper and simpler due to the fact that Bokodes can provide information about the direction and also an identifier." The applications, therefore, are many, but there are still a number of challenges to be overcome. 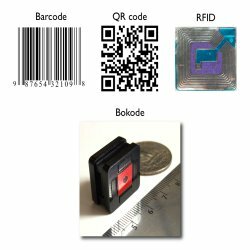 One is to make the Bokode cheaper in order to compete with current barcode prices (around 0.005 dollars for a classic barcode and up to 0.30 dollars for an RFID tag). At the moment, a Bokode costs around 5 dollars, but its developers say this could go down to 50 cents. Cheap cameras, like those in most mobile phones, have a very small aperture size which makes the entire scene appear in sharp focus. This presents us with yet another challenge: "the Bokode uses the defocus blur of the camera to decode information; this is hard to achieve with a cell phone camera unless it is placed very close to the Bokode," explains Mohan. "We are working on solutions that use motion blur (translating the camera during the exposure), or capture multiple photos by jittering the camera position slightly to recover the Bokode information even with a mobile phone camera." Ankit Mohan, Grace Woo, Shinsaku Hiura, Quinn Smithwick & Ramesh Raskar, Bokode: Imperceptible Visual tags for Camera Based Interaction from a Distance, ACM SIGGRAPH (2009) , (link).